A Celebration of Cuban Culture featuring Live Music & Dance Performances. Dance the night away with a Rumba, Saoco Son - Cuban band, Willie Candela leading a Cuban Casino & Timba Dance Line & his Rueda de Casino, with DJ spinning the latest Cuban music between live sets! Caribbean Cuisine, beverages & mojitos available for purchase. A Gozar! Admission: $10. An all ages event. The summer just keeps on getting better...a lo Cubano! On July 28th at Queen Bee, there will be a screening of the Film "La Salsa Cubana", a documentary film by Eric Johnson & Sarita Streng, which follows the history of a dance group from the Guanabacoa neighborhood in Havana. The film opens a fascinating window into the lives of Cubans, and is a dancing inspiration! It will be followed by a night of dancing to the best Cuban dance rhythms! The following day, Sunday, July 29th in the afternoon at Queen Bee, Eric will be giving unique workshops for beginning through advanced dancers. Don't miss either event, exact times to follow! Casino on Cardboard is ready to set off on Saturday, June 23rd fro 4-8pm. If you've never been to a Casino on Cardboard event, it's basically a free Cuban salsa dance party on a cardboard dance floor. Come dance with us in beautiful Oceanside Harbor, plenty of beach space to watch the sun go down and dance to some great timba and son! Location: Oceanside Harbor Beach in front of the Marina del Mar Condominiums 1202 N. Pacific Street Oceanside, CA 92054. 1. If you want to help set up the dance floor on the sand, please be there at 3pm. 2. Bring finger food and drinks. 3. Help create carpools to the far north end of San Diego. We know it is way up north, so carpooling is encouraged. Bring the south to the north! This looks like a great line up of Latin bands and orchestras. For those of you who want to dance and share in the Dia de San Juan Salsa Bachata Festival (Tribute to El Rey "Tito Puente," you don't want to miss this amazing event! Anthony Garcia (fellow casinero) has advance tickets, which are discounted over the door price. He can be reached at anthonysalsa@gmail.com. Hey gang!We got the call back from the Kava Lounge to throw another party this coming Tuesday, so join us and get your Timba Hip Hop and Cubaton groove on! $5 at door, 9pm till midnight or later. Please help make this a regular monthly event by supporting the bar and buying a drink (or two). The folks at the Kava Lounge appreciate that. Brand new jams are gonna be burning off the the speakers so don't miss it. Spread the word, ahi na ma! Below are all the details. Click this link for the Facebook event announcement. Summer in San Diego is hot with Cuban events. 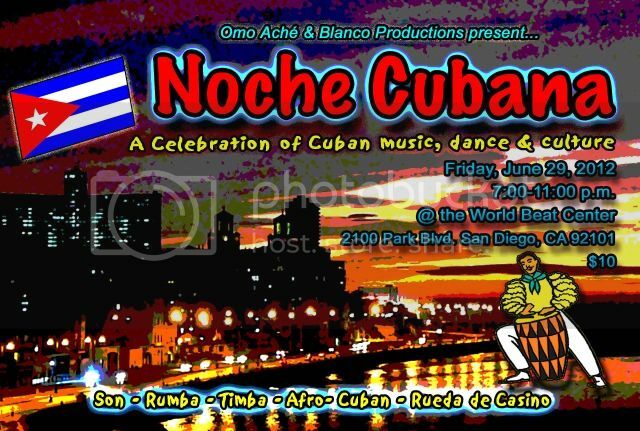 Come and enjoy Noche Cubana and dance with all of our dancing family in San Diego and beyond! Below are the details. Let's caravan to Los Angeles for the Curuye Party! CELEBRATING THE ARRIVAL of SUMMER at CURUYE.COM’s OUTDOOR CUBAN SALSA TIMBA DANCE PARTY, featuring LIVE CUBAN TIMBA w/ ANTONIO SAUZA & MONEDA NACIONAL, and DJ SAOCO spinning between live sets! CURUYE.COM is honored that ANTONIO SAUZA has chosen CURUYE’s CUBAN DANCE PARTY for his graduate performance with his timba band MONEDA NACIONAL, a presentation that culminates his AFRO LATIN MUSIC studies at CSULA for the Master’s in Music. This first outdoor Curuye dance party of the year will open with Antonio singing for Eleggua of the Afro Cuban lucumí tradition, followed by a rumba, then LIVE TIMBA, and DJ SAOCO will do his thing between the live sets to keep us on the dance floor. Looking forward to KATI HERNÁNDEZ leading one of her HOT AFRO TIMBA LINES, and sharing a dance and some cake with KRYS, STEPHANIE & MARLON! It all takes place on the beautiful patio of TRÓPICO de NOPAL GALLERY & ART SPACE in Echo Park, $10 cover. Chef KELLY will have a tasty plate available for purchase, and bartender RAY will be whipping out his incomparable mojitos! Please contact Curuye.com if you'd also like to celebrate your bday on June 9! Carpooling from San Diego Location at time: Contact Maritza at 206-300-4523 or e-mail at sbdiva32@yahoo.com. We plan to leave at 6pm from the Oceanside Park & Ride (off the I-5 and Hwy 78 on Vista Way and Moreno St.). There are two cars.One is already full and the other has room for three more people).